Learn how to make your own kombucha with a delicious fizz and ginger! Have you been wondering how to make that fizzy ginger kombucha with just the right amount of kick and sweetness? Well look no further! 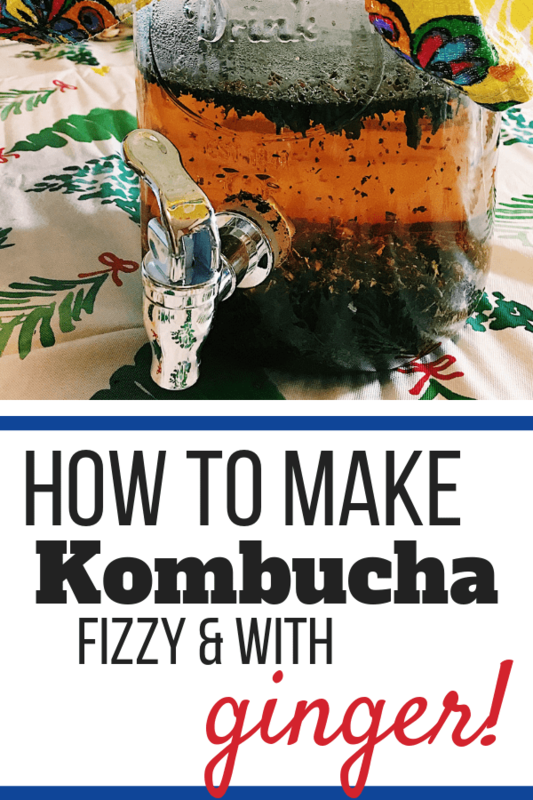 Below is a delicious and easy way to fizzy kombucha heaven! 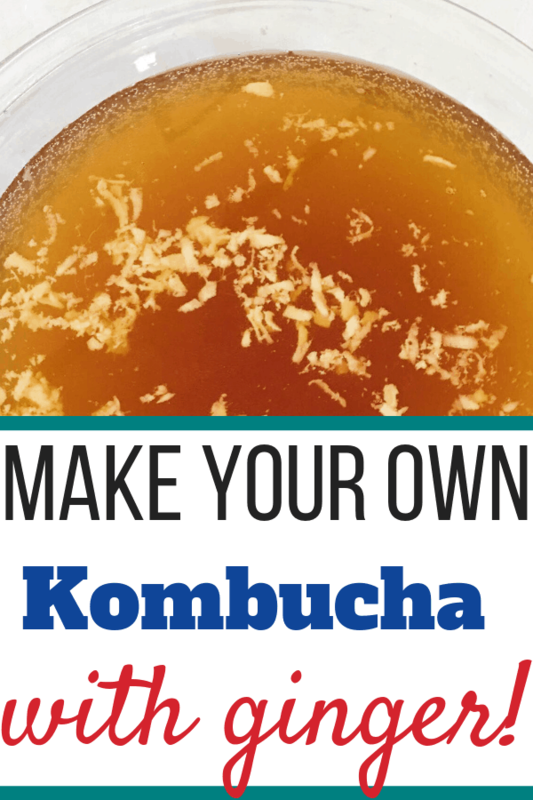 The kombucha recipe below tells you how to make the first stage of the kombucha or the first ferment. Making kombucha is not an overnight process and can easily take 10+ days when all is said and done. However the benefits of this healthy probiotic drink is well worth the wait! We may earn money or products from the companies mentioned in this post. For more information, see our disclaimer. Important: Please make sure you have a kombucha scoby beforehand. You can easily purchase yours through Amazon or other reliable sites. Or perhaps a kind friend will gift you one! You cannot make kombucha without it! I recommend an organic scoby like the one below. 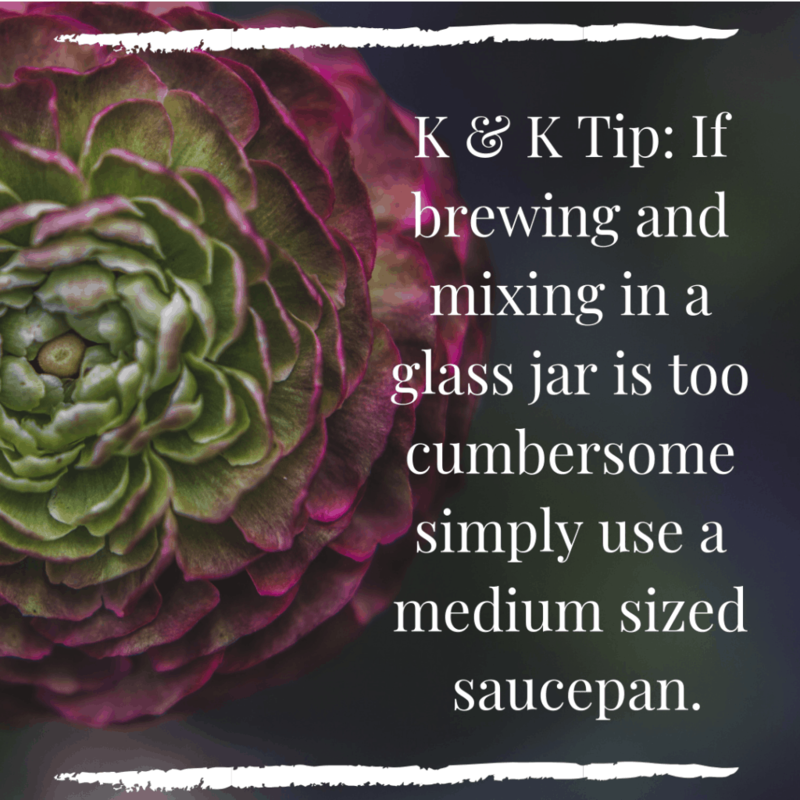 For this recipe you will need a scoby and enough starter tea to equal 2 cups. Measure 8 cups of water into a medium sized pot or a teakettle whichever you prefer. Bring to a boil. Pour boiling water into glass gallon jar. If using loose leaf tea, you can place the tea in tea balls if you have enough. 1 tsp. of loose leaf tea=1 tea bag so for this recipe you need 4 tsps. of black tea and 3 tsps. of green tea. Or you can pour your loose leaf tea in like I did. For tea bags, push on the bags gently with your spoon so they sink under the water and release the tea. Brew tea for 10 minutes. Remove tea bags gently with tea spoon. Do not attempt to squeeze tea out of the bags as that will make your kombucha bitter. For loose leaf tea, strain tea with either cheesecloth or a strainer. Set tea leaves aside for your compost. Add 1 cup of raw cane sugar to your tea. Stir with spoon until dissolved. Next add 5 cups of cold water to your tea. Cover jar with a glass or plastic lid. I used a kitchen cloth secured with twine. Place jar outside if cold and let it cool overnight. Make sure no animals can get to it. You can also let it sit on the counter overnight until cool. If you don’t want to wait you can chill the tea rapidly with an ice bath. Now that the tea is cool, you can now move on to the final but most important step, adding your scoby to the brewed tea. 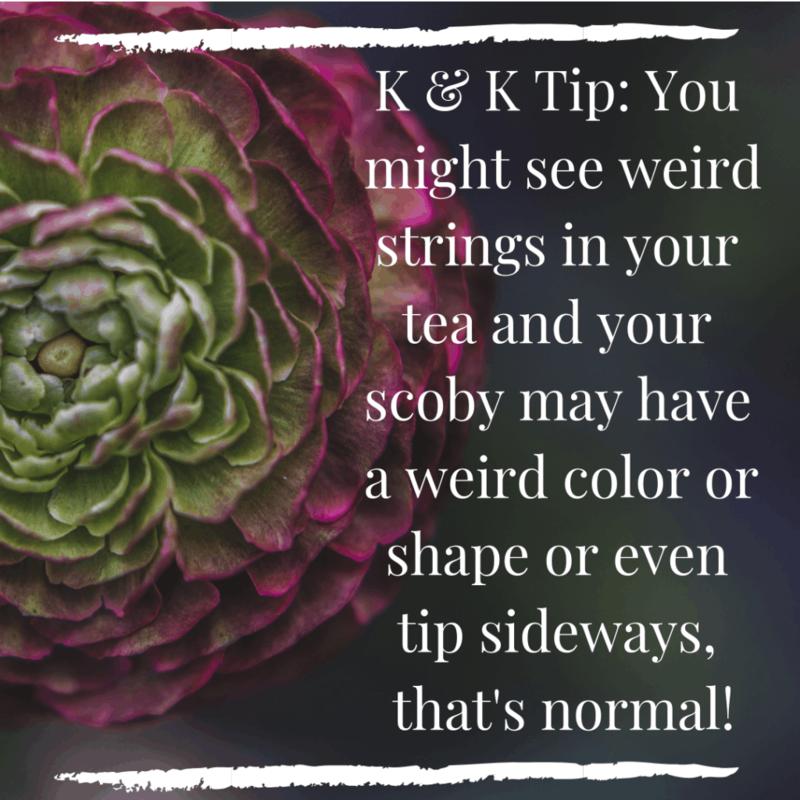 Gently remove your scoby from the starter tea with a wooden or plastic spoon and place into your brewing container. Add 2 cups of the starter tea the scoby was in to the mixture. Place 2-3 coffee filters on top of jar and secure either with a rubber band or kitchen twine. Place the jar in a dark cupboard for the next 7-10 days. Check periodically to see if a new “baby” scoby is growing on top of the mother. Once the baby scoby has reached the size of the mother, your first ferment is done! You no longer just have brewed tea, you have successfully learned how to make kombucha tea! Second step is coming up soon!!! If you are making this recipe, drop your email below and I will send the 2nd stage of kombucha making as soon as I’m done!! Learning how to make your own homemade kombucha is a skill you will never regret. Although this kombucha recipe has ginger, you can experiment with many different fruits and flavors! However if you feel like you simply don’t have the time and you wonder where to buy kombucha drinks you can certainly do so! You can purchase kombucha on Amazon and look for it in your local grocery store. This is a very good way for you to taste the different kombucha brands and decide which kombucha tastes better!!! Love homemade recipes??? Have you tried my organic chicken soup for flu yet?? It’s healthy soup for you when you have the flu, cough, or cold, but it’s good anytime!!! I occasionally pick up some to try at my local Aldis or Walmart. This brand is my favorite! If you want to try homemade kombucha try asking around, chances are someone will know a crunchy mama who sells it! Concerned about your gut health? While drinking kombucha is good at restoring healthy gut flora so is a colon cleanse. Check out these benefits of a colon cleanse! 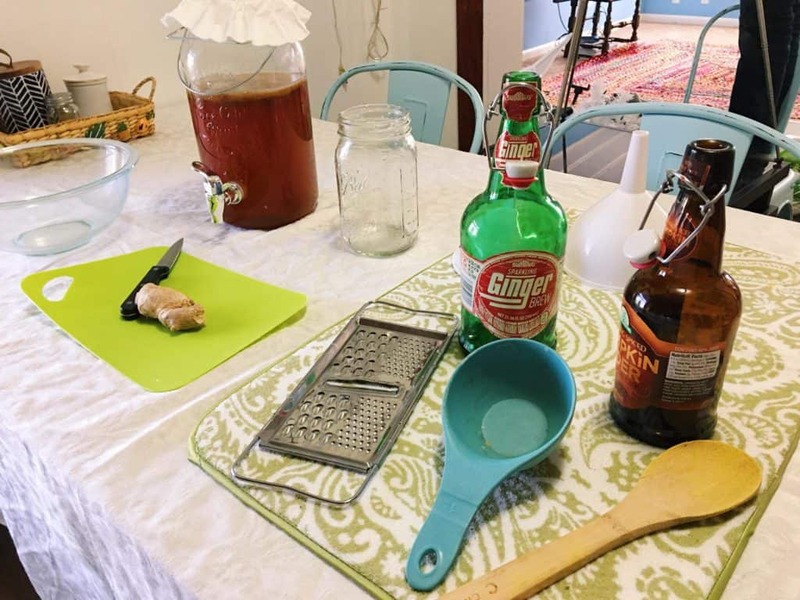 Have you enjoyed learning how to make fizzy kombucha with ginger? Comment below and let me know if you tried it or tag me on my instagram and comment tried it!!! I couldn’t have said it better, you are absolutely right! Ginger ale is the only soda I like, apart from root beer. It makes me happy that both can be made at home with healthy ingredients! I’ve made both with kefir, but still haven’t tried komboucha – thank you for the tips! Yes that is so true, I haven’t made homemade gingerale or rootbeer yet but those are definitely on my list as they are two of my favorite drinks! I’ve been wanting to make kombucha forever but never took the time to figure out where to get the scoby and how to actually do it. This is laid out to follow step by step. I’m going to have to try it. Thanks! Let me know how it goes for you!!!! I would love to hear! The process is little complicated but totally worth it. I love it with ginger! Yes the benefits outweigh the process for sure! I love ginger kombucha! Actually, I love anything with ginger… But I have been wanting to try making kombucha for a while now, I’m just nervous to make the dive! Thanks for this recipe… I will be trying soon! I love ginger too!!! There’s quite a few steps but as long as you attack it one step at a time, it’s very doable!!! You can do it!